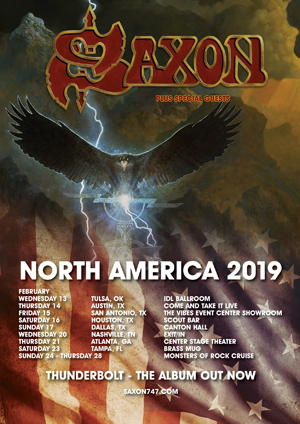 The Mighty SAXON are pleased to announce a string of US Tour dates, following the incredibly successful tour with JUDAS PRIEST earlier this year and prior to their appearance on the 2019 Monsters Of Rock Cruise out of Florida. Tix go on sale next Wednesday, 10th October at 10am (local time). See you on the road and be sure to get your tix fast - we expect these shows will sell out fast!